Put "Amazing Race," "Clue," a soap opera, and an escape room in a blender and this delightful slice of TV is the glorious result. If you combined the puzzle-solving thrill of an escape room, the location-hopping allure of “The Amazing Race,” the amateur detective appeal of “Psych,” and the controlled, directed chaos of a reality show, you’d get something close to “Busted!” Part of the ever-growing catalogue of international imports under the Netflix Originals banner, this Korean variety show may be an unfamiliar genre to many English-speaking audience members. But the unclassifiable delights of this live-action ongoing murder mystery is something that translates to any language. 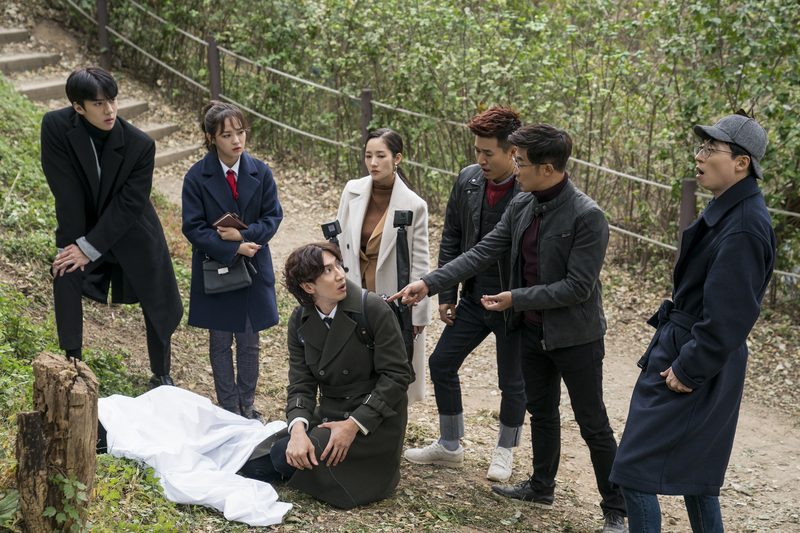 The overarching premise of “Busted!” is shaky following at times, but most episodes follow the idea that some shadowy force has gathered eight Korean celebrities, playing different versions of themselves, for a dinner theater-style mystery gone awry. When their first host winds up dead, the group gets led on a wild cross-country chase, with plenty of indoor and outdoor puzzle-solving along the way. That process of deciphering clues to advance to the next part of the story gives “Busted!” an immersive theater feel at times. It doesn’t take long to notice that all the participants seem to have a general idea of where this story is heading, but the looseness of the show leaves plenty of room to play around with each individual setpiece. “Busted!” wears that shagginess proudly, pairing a tightly constructed set of clues and challenges with a format that does away with everything but these participants enjoying the ride. No weighty philosophical dialogue, just a handful of fast friends following a trail without questioning the fact that it’s happening. Even if this group doesn’t carry more recognition beyond a group of ordinary individuals, there’s still plenty of joy to be had from watching them navigate this escalating series of obstacles. Part of the fun for the participants in the series is that they’re each riffing on the cultural cachet that they already have with audiences who recognize them as celebrities. Comedian Yoo Jae-suk becomes the show’s central Sherlock Holmes figure, wearing the signature deerstalker hat along the way. Ahn Jae-wook becomes one of the more bookish brains of the outfit, while K-Pop vet Kim Jong-min plays along as the group’s resident airhead. Not every challenge caters to each persona, but the variety of word- and slapstick-centric obstacles give each of them a chance to shine. These are procedural, self-contained episodes, each with at least a half-dozen different obstacles ready-made for the group as they follow their destined paths. Even when it tries to add an extra sense of how each of these characters fit into the overall framework of the show, there’s precious little artifice in “Busted!” As these amateur sleuths traverse parking lots filled with dirty cars, quiet costume-party interiors, and even a pole-dancing studio, the clues they find are all put on the screen as they’re spoken aloud. Occasionally the prime players are all mapped out in a clearly outlined evidence wall or a split-screen thread. The appeal of the show isn’t trying to stay one step ahead of the detectives on display, it’s seeing how they hop from marker to marker with reckless abandon. That focus leads to a puzzle-based pursuit that works across a number of different atmospheric conditions. The show is not afraid to have some of their characters work to solve a complex math problem while mere feet away their compatriots get pelted with a steady stream of water balloons. In fact, some of the best parts of the show come from recognizing that there are tiny surprises that even the participants themselves aren’t privy to. Much of these interactions are built on giving the audience a little time to work out solutions on their own, but occasionally when something pops out from a trunk or behind a wall, that genuine sense of shock turns the tables on who the audience is supposed to be. Some of these puzzles require a close attention to language that may seem like a stretch at times, but they keep the show from falling into the same kinds of challenges episode to episode. Whether the participants are charged with solving crimes or clues, the team-up nature of getting to that final objective gives the chance for the show to put each of these individuals in different combinations. It’s a perfect pickup for Netflix as it experiments with weekly additions, given the length of each installment (the premiere clocks in at a formidable 97 minutes). Regardless of the extent that these participants are in on the joke, “Busted!” thrives on the same kind of predictable unpredictability that runs through much of American reality TV. It becomes a far more enjoyable experience when it exists in its own strange unquantifiable grey zone, when a sinister government plot materializes from nowhere or when the show takes on occasional meet-cute diversion. “Busted!” can be anything it wants, and in return, the audience has options, too. Try to follow along with Yoo Jae-suk or sit back and let it all unfold: you’re in for a treat either way.